Whilst Scotland is covered with snow, there is definitely one man with sunshine in his heart and a fiery band around him that heats up that cold winter there. 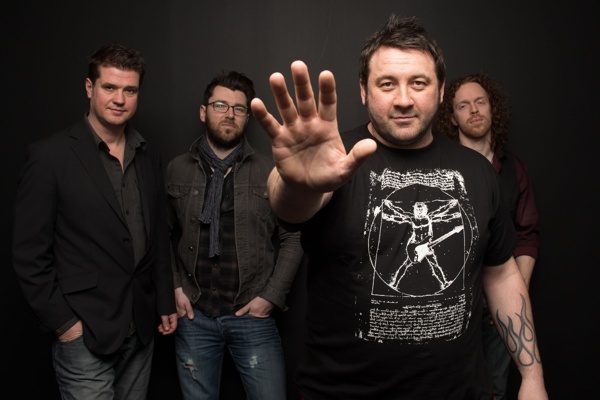 I had a lovely and funny phone call with the charismatic frontman Alan Nimmo from KingKing about their third studio album 'Exile & Grace'*. Congratulations to your third studio album 'Exile & Grace'. It is about "the state of the world, that beautiful blue planet, that's running into a battlefield." Could you explain your point of view about the current world situation and what the album is about? I am not coming from any political background, I am a musician not a politician, just to make it clear from the beginning. But just from a humanity point of view, I am looking at this beautiful planet when I travel around and I see all this natural scenarios everywhere and then you come home, turn on the TV, see, that people destroy the environment or are fighting in wars, that makes me just emotional. The older you get, the more you start thinking about your future and things like that. It is just sad cause we are living in such a wonderful place and we are so lucky and privileged, but the world gets more and more exploited for our sales. Especially as I am a father and I care about the future generation of our planet, I believe in peace and harmony for our world. I am not trying to grab anybody's attention or to wake them up. This is about the way I feel. It is just my way of living, that we can be aware and make a difference and hopefully people who listen to my music, get inspired by that. I really like the meaning of the album, it is a deep and more than "broken-hearted" story. One of my favourite songs on the track is 'Find Your Way Home', an intense ballade with meaningful lyrics. What is the story behind that song? It has a very general meaning, because I wanted people to relate on the story in their own way. It's about saving what you have, whether it is family, fans or a relationship. Sometimes we lose our way and then it is just nice to hold on to the hope, that we can find our way back home. When I write songs, I draw them from experience and take it from that but often I put it into something universal. Of course there is a personal story behind but for me it is important to give songs access to the listeners, so that they can understand them and relate to them as well. Is there a song on the album that is your favourite or means the most to you? That is hard to answer. I guess thinking back, they all have a very special and deep meaning to me. That's why the album has only 9 songs. You know, I didn't want to put on songs on the album to just fill the gaps. I rather have less but every song has an intense meaning, so that you really want to listen to every song. I recognised that every song was very strong and each song sounded great. For mixing the album, you have chosen Chris Sheldon, who already worked together with "Foo Fighters". When it comes to production and recording, do you chose the producer yourself? What's important for you in that process to create the sound you want? Myself and Wayne, the drummer, we always produce the music by ourselves. We write, record and produce them. It can be a bit over helming, and so you need a touch from somewhere to look over them and make the difference. So Chris mixed the album. I could hear the sound in my head that I wanted to have. So from an audio point of view, it was important to get someone in to do the sound. We sent one song to Chris and said, just get your idea into the song and make it sound, the way you feel it should sound. When it came back, it sounded exactly the way we wanted it. So he completely met our vision. Immediately we said, do the rest of the album. I am so glad, that we had him, he has done a wonderful job. Without him, the album wouldn't be as good as it is now. He created a remarkable sound to each song. He made the effort to mix each song individually and sent it back to us. Although each song has a unique sound, he managed to create a recognisable package of the album. Even though the music was slightly different from what we did in the past, it still has that King King sound, but with a step forward. In the UK your album has reached number 31 in the official album charts. What an achievement! Congratulations! Especially nowadays where Blues Rock is thought of as 'Old- School'. But with this you have proven that Blues Rock is still commercial and successful. Thank you, that was really a cool thing. Whatever you do if you do it with a passion and honesty, I think no matter what you do, it can touch people. At the end of the day, that matches each style of music. But for us this was a big achievement, for a band that is coming from nowhere, we were very happy and surprised about that. We also reached number 7 in the Scottish Blues Charts and number 1 in the amazon Blues charts. It was fantastic and we are very proud of that. You said you want to bring the band as far as you can. What plans and goals do you have? That's a good question. I keep on telling this to people and I think: "Where is that?" It is just to keep consistency and work on what we are doing, and each time you get better and stronger as a songwriter and performer. We want to keep on doing music that people can listen and relate to. Success is a subjective view. For some it might be driving a Rolls Royce. For me it's not. It is more worth it, if people are thankful about our music. For example. There was this couple coming to our shows, years ago. They didn't know each other. They both loved a song that I have written. And they came together just because they started to find the connection due to that song. They ended up having that song on their wedding. And that's great, if we can move people like that, for me that's a success. And if we can continue doing things like that and get people goosebumps and make them smile, then that's awesome. Of course we have these wishes to play in certain venues or being on stage with certain artists, but we just keep on working hard and see where it goes. Where we are now, was not easy to get, we worked really hard for it. But we are very lucky to live our dream. The good thing is, I feel, where we are now is just the beginning of King King and it is time to start now. You started off with your Brother as Nimmo Brothers. Tell us about your past. Yes, my brother joined my band in 1995 and we stayed together for 20 years. King King was far later than that. But after King King got bigger and bigger, we had to make a decision, as it was getting very busy to do both. And my brother was encouraging me to follow up with King King, as he could see the potential and was really pleased for me. We didn't split up Nimmo Brothers, we just took a break and at some point we will do something together again, who knows. It is great to have your family with you. Of course, growing up can be a nightmare as a younger brother (joking). Nowadays we are older than that. We love playing together and whenever he is around, we have him for King King on stage for a Jam and it's still great playing with him. What was your greatest stage experience so far? There were many. Sometimes the smallest gigs can have the greatest moment. But on the new album I have just written a song about that. 'Tear It All Up' is about the tour we had with Thunder, who used to be one of my favourite bands. I have been watching them since 1990 and it was such a privilege to go on tour with them. We had the honour to join them for the London Wembley arena. The song is about that experience, about waiting backstage, then going to that big stage, playing, hearing the underground rumble of such a huge crowd, clapping, screaming and singing along our songs. That was amazing having so many thousand of people joining your songs. But it can also be those small, intimate gigs, that gives you that magic moments. But of course, that one was special. So you are going on tour with Europe this Summer. Another big deal. Congratulations! Is there any band or artist you would like to tour with? Is no secret that I am a huge fan of bands like Free and Bad Company and I would absolutely love to be on stage with Paul Rodgers or David Coverdale. I love that type of music. It always captures me. I remember when I was kid, I was listening to songs like 'Fire And Water' from Free, and I couldn't believe this guitar tone coming out and then this voice came in. But we had a great tour already with John Mayall & the Bluesbreakers which was fantastic, then we go on tour with Europe. Things just happen and we are so happy and grateful that we can do all these things. Let's see what the future brings! *Click HERE to read the 'Exile & Grace' album review. Click HERE to read Cheri's King King live review.